Baby shower sock game is a game for everyone. Whether you are hosting a coed party, small gathering or a big group the sock matching game will be a hit. A simple game to prepare as all the hostess will have to do upfront is come up with a lot of socks. Different colors and sizes is ideal as it will make it harder to sort. The number of socks depends on the number of players and how you want them to compete. You can have player vs the clock, player vs player or teams of 2. For player against the clock, try to have at least 2 dozen pairs of socks. While for head to head anything upwards of 60 pairs of socks will make the competition worthwhile. How the game is played? 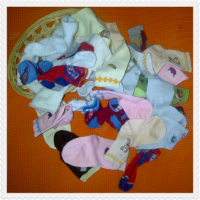 With one minute on the clock sort and pair up the socks from the pile and put them in the basket. The person or team that has the most matching pair of socks at the end of the minute is the winner. Of course Winner takes "Socks." Cute and funny pairs of socks will make a memorable game prize. Mommy to be is also a winner when you gift her all the socks from the game.